Whether in the gym or the pool, our instructors make new students feel safe by using games and toys that incorporate the skills they need to learn into a fun environment. Students don't realize that they are doing things that they would normally be scared to try. Although classes are fun, they are always focused on strong technique and safety skills. We encourage children to problem solve so that they can get to safety in a variety of situations. Swimmers learn to roll onto their back, swim back to the wall and to self rescue without goggles. Climbers practice safe falling techniques, wise decisions, and knowing their limits. Yogis discover ways to self regulate during stressful situations and to listen carefully and Be Aware. We include safety practice in each lesson as well as occasionally devoting an entire week to endurance and safety. Since all students are familiar with the yoga practice we blend this into each sport to practice self regulation. When children are able to succeed without being held back by anxiety we see an exponential growth in physical development in each discipline. Each Jelly is two weeks long with the first week dedicated to introduction and the second week application of new concepts. Younger classes often incorporate books into each class as well. Pete the Cat can teach us about trying difficult yoga postures (Eagle comes and eagle goes, but do we cry? Goodness no!) and climbing with our core (My button, my button, my belly button close to the wall). Older students focus on things like core strength, stroke work and balance poses without the extra attention grabbers. By utilizing global themes and repetition throughout our program, we see better skill retention. If the Jelly is Superheros: Being brave and trying new things in swimming, students know to expect the same in climbing and yoga. Check our Facebook page to see what Jelly our students are working on today. Since each curriculum has been developed with a common goal and from the same mindset, they blend together to serve as a catalyst for progression. Similar tools and techniques are used in all classes reducing the need for a child to adjust to each program individually. Sensory, motor, and social awareness are woven into the program, so that all students are working side by side without having to single out children who require special adjustments. Whether enrolled in swimming, climbing, yoga, or all 3- children will have a sense of community. They will be with the same peers for different disciplines and often learn from each other. While Nolan excels in swimming, Sydney is a natural climber. This can help to facilitate camaraderie and cooperative learning. our classes keep climbers active and engaged. 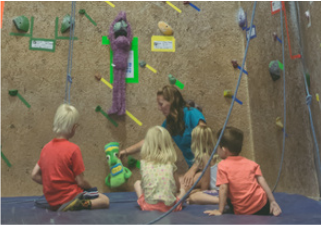 ﻿﻿At PBJ, we strive to provide high quality climbing lessons that will get children excited about the sport while learning new techniques and concepts. Climbing is a lifelong sport that promotes a healthy and active lifestyle. In addition to learning specific climbing techniques, children will also exercise problem solving, self regulation and listening skills. Students will learn how to safely navigate a busy climbing gym and make safe climbing practices a habit. Climbing offers a great opportunity to hone motor skills and build confidence. Students will practice critical thinking skills in order to make safe decisions when climbing on playgrounds, trees, and rocks outside. Climbers get a boost of self esteem after working through a problem and conquering fears. 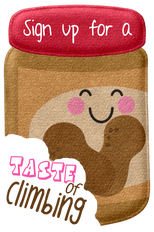 At Peanut Butter & Jellyfish climbing classes, the safety of your rock star is our top priority. Our Be Aware safety program teaches young children to be safer while climbing rocks, walls, or monkey bars. Activities are chosen to keep kids engaged and using different senses. All of the class components are achieved through games and challenges that require climbing. When learning the names of different holds, students may climb to retrieve monster food from jug holds and feed it to Bob-our resident trash can. Older climbers play hangman and twister by completing a difficult problem before making a move. By incorporating breathing and self regulation exercises into our lessons, students are able to gauge unsafe levels of energy and have the tools to bring it down a notch :). Each class includes warm up climbing, active dynamic stretching, Jelly discussion, climbing games to practice new concepts, and stationary static stretching to cool down. Younger classes are designed to prepare students for future technical climbing while getting a "I must climb every couch and bookshelf!" fix. By providing a safe outlet for natural monkeys we can reduce the risk of injury at home and school. Climbers will learn to communicate with coaches and make good decisions. The Jelly of the Day is our focus for each class. Typical climbing Jellies include safety, footwork, knots, movement, belaying and projecting. Some Jellies also include a fun theme such as robots when learning about the crux of a climb, or monster mash during footwork lessons. We aim to increase retention by incorporating fun toys and games so that students learn the same concept in several different ways. Repeating each Jelly 2 weeks in a row also aids in this process. Our Be Aware safety program teaches students to be mindful of their surroundings and choose safe zones. Through repetition and practice children learn to safely navigate a busy climbing gym. The kids remind Tiki Bob to "never stand under a climber"
little yogis leave feeling grounded and confident. ﻿﻿﻿﻿﻿While all of our courses have mindfulness and breathing exercises woven into the curriculum, it is the yoga where they are free to explore these concepts. We want to make yoga and meditation practices accessible so that children don't have the stigma associated with beginning a practice in their adult lives. Children's yoga can greatly increase a child's body awareness, self esteem, balance & coordination. Rather than the typical flow seen in adult yoga, children's classes incorporate simple postures into fun games and stories. Kids are always moving, and we encourage that! Mindfulness encourages awareness on a physical, emotional and social level in all children. This is achieved through a range of age-appropriate activities including games, meditation, visualization and discussion-based sharing of experiences and feelings. Our yoga classes are designed to be a workshop where children can tinker with skills that will be applied in all of their classes. In a less structured environment, kids have the space to experiment with movement and see where their bodies take them. 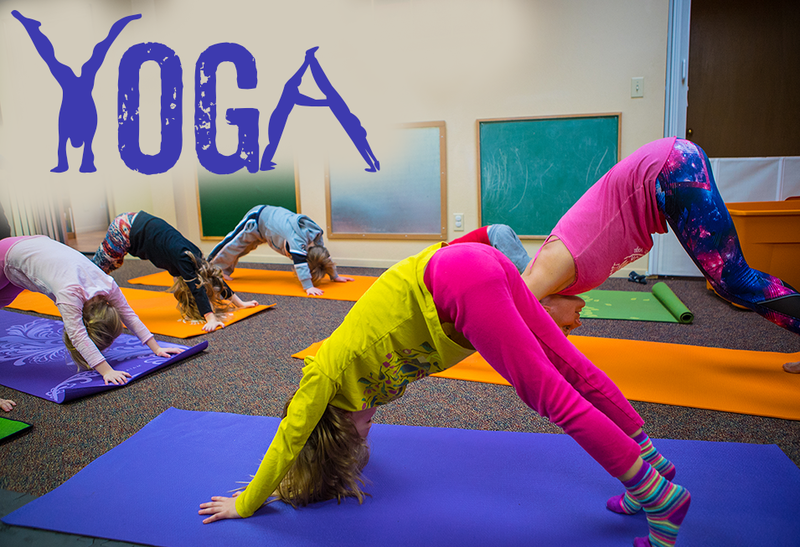 Yoga allows us to ditch the agenda and follow the children's lead. Each practice includes the listed components but the format may change depending on class dynamics. Yoga Wiggle- Toddlers will learn simple yoga poses in a kind and forgiving environment. Repetitive songs and easy poses will keep kids engaged while giving them space to explore the environment. Early breathing exercises will be introduced to help calm young minds and relax little bodies. Parents are invited to join in the fun and sing along! Yoga Stretch- Build character and learn self regulation skills through fun, active games. Kids are encouraged to bring awareness to their breath and body. With an emphasis on mindfulness and breathing, school aged children will learn to self regulate. More complex poses and sequences will be introduced. Yoga Breathe- Offers predictable routine with chanting, breathwork, and close attention to technique. Calming atmosphere with fewer distractions and slower tempo than Stretch classes. Yoga Breathe classes are closer to the format of an adult yoga class with postures and sequences replacing games. Poses are adapted to be accessible to every body. Yoga Breathe classes are available as private or group lessons depending on each athlete's needs. We introduce breathing and meditation techniques that children can apply in every day life. By including character building stories and exercises we aim to develop well rounded young citizens. 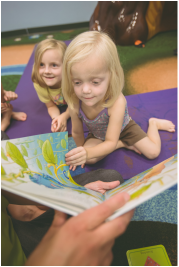 Yoga stories encourage imaginative play, inquisitiveness, and problem solving with peers. They can stimulate a child's imagination and help them develop empathy. Children are encouraged to question, express ideas, participate, and influence storytelling within sessions. Students engage in active listening while reading stories that may ask them to jump, stretch, or be still. This practice is then applied throughout our courses from the mat to the wall and the pool! we get your little fish swimming...REALLY swimming. 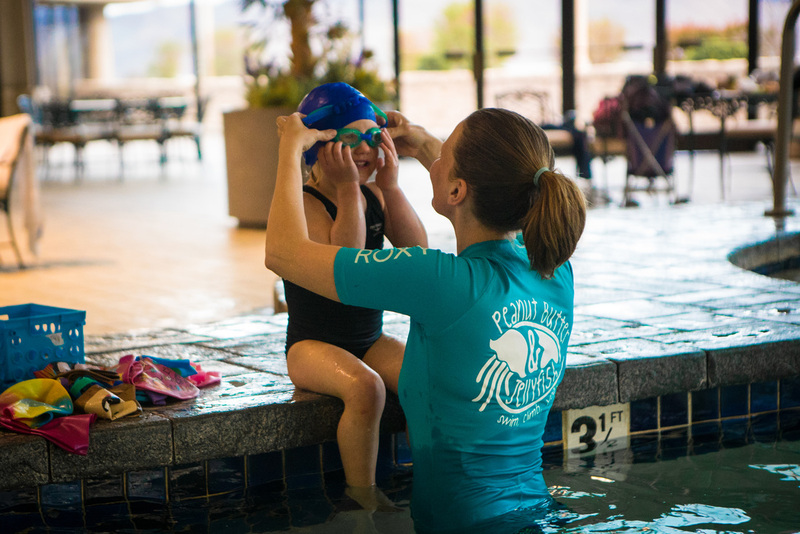 ﻿﻿PBJ offers swim lessons for students ages 3 mo-Adult at beginner-competitive levels. We have both private and small group lessons as well as programs for students with special needs. Learning to swim at a young age is crucial to your child's safety and development. Since safety is the top priority in our lessons we stress various ways to get back to the edge, and how to roll over to breathe should a child fall into a pool. All of our instructors have extensive training and are CPR certified. They are prepared to teach your children in a fun, effective manner. We are always looking for ways to improve our program, and your little fish reap the benefits of this search for excellence. With low 3:1 student to instructor ratios, your kids accomplish more in each 30 minute class. Each class consists of 15 minutes working on progressive skills (this varies for each unique group) and 15 "Jelly" minutes. Each Jelly lasts for two weeks and ensures that all of our swimmers are learning to use different types of movement in the pool. Typical Jellies include safety, breaststroke, kicks, diving, and endurance. Certain classes also integrate a fun theme such as Pizza Party during the breaststroke Jelly and robots during backstroke. We don't use flotation devices in our beginner levels because they can create a false sense of security and promote poor body position. Children work directly with the instructor on each turn so that their form is being corrected before bad habits can develop. Our philosophy is that every child can learn to swim. Each child is taught through a unique approach that best suits their learning style. Our emphasis is on water safety skills, and pushing students to progress to their full potential. All of our students are encouraged to take their swimming to the next level, and it's amazing to see what they can accomplish! By utilizing the roll-over technique our younger swimmers are able to swim longer distances independently by rolling onto their back after every 4 arms to take a breath. This leads to safer swimmers who can get themselves back to the wall should they ever fall in to a pool. 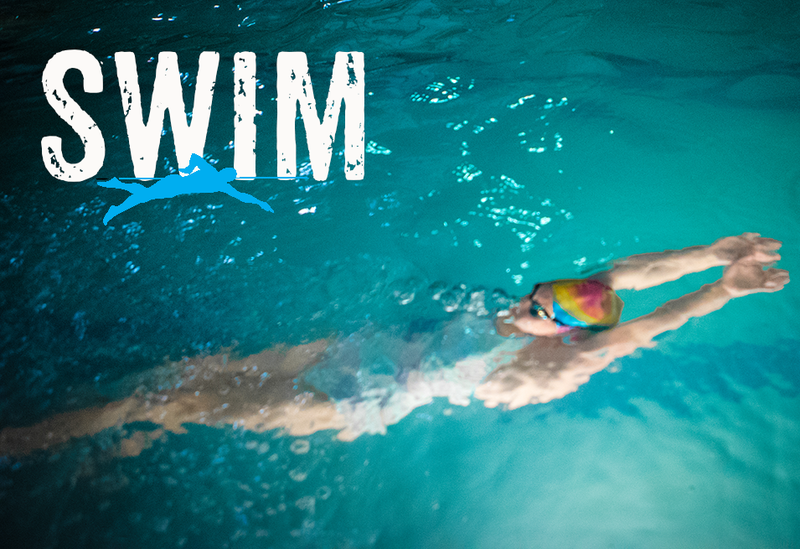 This method also eases the transition into proper freestyle breathing for faster progression.